Bishop Konrad Zdarsa consecrated two deacons to the priesthood. "We are gathered together with Christ in unity with the Bishop of Rome and as the Church of Augsburg," the bishop addressed the faithful at the beginning of the ordination in the Rectorate Church of St. Sebastian. André Schneider from the Sacred Heart of Jesus Cathedral and Andrew Theurer from the parish of St. Gabriel in Deuringen. Both were evangelical pastors until a few years ago, before they converted to the Catholic Church and came to the diocese of Augsburg. 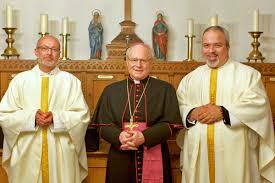 In his sermon Bishop Konrad went to the question of vocation. The question of the priestly vocation is therefore also a question of the faith of all believers: whether they wanted to accept and believe that God would continue to found his church in the future on people who have heard the call to follow Christ and are ready to to renounce the primacy of all other desirable human development. Bishop Konrad. "The dispensation from the priestly obligation to celibacy was granted by the Holy Father, after careful consideration and in accordance with the nature of ecclesiastical law, in accordance with his practice, practiced much earlier."